Pneumadyne has been designing and manufacturing innovative, high performance hydraulic and pneumatic manifolds since 1976. We offer a wide range of standard manifolds, but if you can’t find one that meets your performance or system requirements, we have the experience and the expertise to develop the perfect custom manifold for your unique application. Our engineering team will work closely with you every step of the way, from the design and prototype stages through full production, to ensure that your custom manifold matches your specific needs. We can work from your design files, or create a design from scratch that meets your requirements for fit, form, and function. We can manufacture your custom manifold from an array of materials, including aluminum, brass, stainless steel, polypropylene, and nylon. Pneumadyne’s extensive fluid power knowledge guarantees an effective, efficient design that will deliver the performance your application requires. Our engineering expertise enables us to consolidate components for faster, easier manufacturing and assembly, which also reduces turnaround times and overall costs. 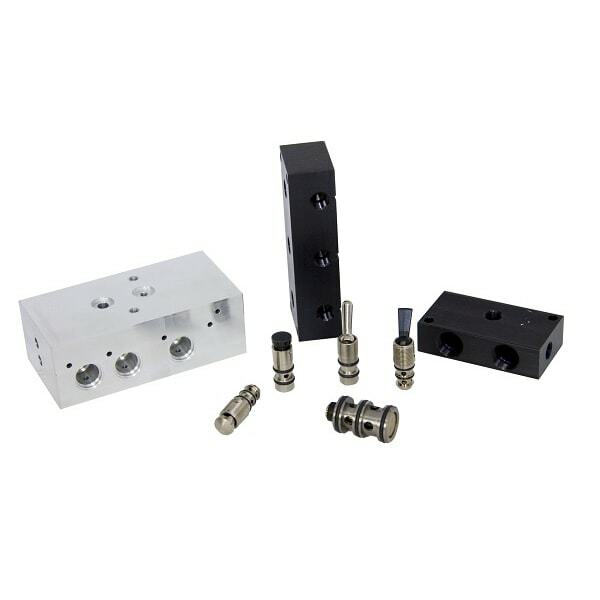 We utilize advanced equipment to precision machine our custom manifolds and ensure tight tolerances (within ± 0.002”) in adherence with your design requirements. Our state-of-the-art CNC equipment allows us to produce complex parts at ultra high speeds for fast, efficient production. We also offer numerous secondary services, including heat treating, plating, and more. If need a hydraulic or pneumatic manifold that meets your exact design requirements, look no further than Pneumadyne. Request a quote on custom manifolds for your fluid power system, or contact us to learn more.